Exploring a new approach to engine internals. 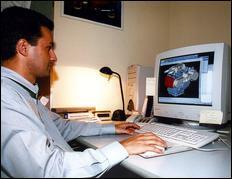 CMC Research in Melbourne has so far spent over AUS$35million developing the Scotch Yoke engine. The design represents a major change in the way in which the internals of a piston engine are organised. For a start, the pistons are connected solidly to the connecting rods (ie no gudgeon pins are used) and the piston/con-rod assemblies move directly up and down the bores, with effectively no sideways movement at all. Further, the 'big-end' of the con-rod comprises a rectangular opening, surrounding a square bearing-block that rides on the crankshaft. The claimed advantages of the approach include smaller engine dimensions, lower Noise, Vibration and Harshness (NVH) levels and - with the inclusion of a balance shaft - almost perfect balance. More subtle potential benefits include the fact that the piston stays at Top Dead Centre longer, lower emissions, and the possibility of better fuel economy through decreased internal friction and altered valve timing. So what's it all about? We recently visited the CMC team, spent a full afternoon interviewing staff, and drove the Subaru Liberty equipped with one of the prototype engines. 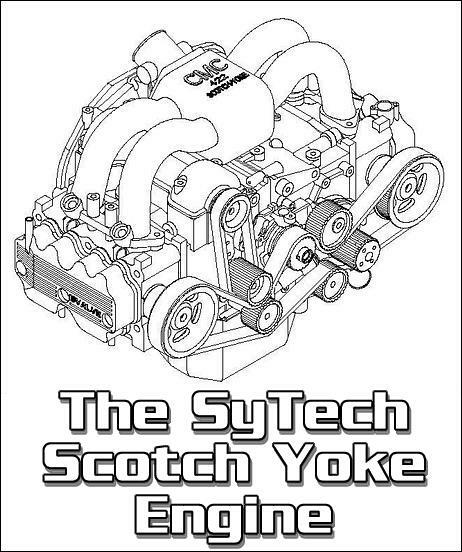 Firstly, it needs to be stressed that in CMC's Scotch Yoke engine (dubbed SyTech by the company), the majority of parts and processes remain as for a conventional engine. This is a major advantage in that a car manufacturer adopting the design would not have to grapple with the engineering and manufacturing challenge of starting afresh in all areas. In fact, the combustion process, cylinder heads, metallurgy, engine management, intake and exhaust manifolds - and so on - are quite conventional. As an example, the Subaru Liberty demonstration car features a SyTech engine that still uses the original Subaru cylinder heads, engine accessories and driveline. Modified for the SyTech application are the exhaust and intake manifolds, while a new block (crankcase) and internals are used. And it is within the block where the big changes are. In the flat four engine configuration being used in the later SyTech prototypes, each pair of opposing pistons is solidly linked together. So, starting at one end of a reciprocating assembly, there is a short-skirted aluminium piston, bolted and dowelled to a shotpeened machined steel conrod. This conrod - much shorter than that in a conventional engine - ends in one half of an open [-shaped assembly. 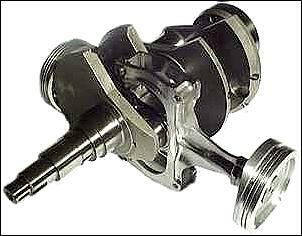 Directly opposite is the other half of the '[', in turn joined to its conrod and the associated piston. 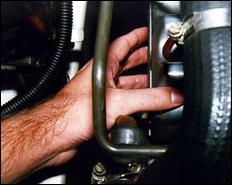 When the [-shaped pieces of conrod are bolted together, a central yoke is formed. Within this central yoke is a square bearing block that rides on linear bearings, and within the block is the conventional round plain bearing for the crankshaft big-end journal. As the crankshaft turns, the bearing block moves up and down within the yoke, translating the circular motion of the crank pin into a reciprocating motion of the pistons and rods. The conrods do not adopt any angle to the cylinder bores - they remain parallel at all times. Effectively, the two pistons and their associated yoke simply move up and down the pair of opposite cylinder bores, while the bearing block - riding on the crankshaft pin - slides up and down within the yoke. 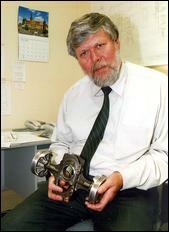 Dr Hans Rosenkranz, Chief Engineer of CMC Research, can be seen here holding the piston and yoke assembly of a prototype engine. What can immediately be noticed is the short distance between the opposing piston crowns - in a flat four configuration, the engine is narrower than can be achieved conventionally. In addition, the piston skirts are very short - and the yoke assembly relatively massive. In this configuration, the opposing pistons join to the same conrod mechanism, meaning that each pair of pistons works with the one crankshaft pin. As you'd then expect, a new crankshaft is needed. 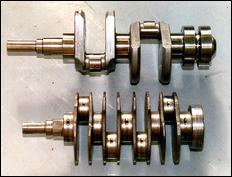 This picture shows both a SyTech engine crank (top) and the conventional Subaru crankshaft. On the SyTech crank the number of main bearings is reduced from five to three, the balance weights are larger, and the crank - by virtue of its smaller number of throws - is more rigid. These crank changes - and the fact that one bank of cylinders is not offset as they are in a conventional V or flat engine - requires the use of a new crankcase. 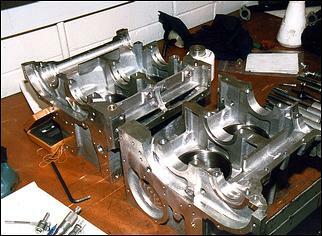 The three main bearings, use of non-offset cylinder bores, and provisions for a balance shaft can be seen in this picture of a new SyTech crankcase being prepared for assembly. Firstly it should be stated that the testing carried out by CMC of their designs has been relatively limited, both because of constraints involving their chosen mainstream comparison engines, and a lack of financial resources. The main production comparison engine has been the EJ22 Subaru flat four - an engine not known for its outstanding attributes in any facet, except perhaps compactness. 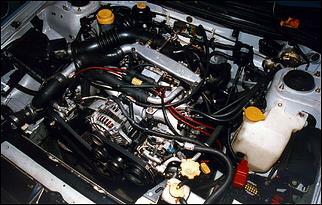 For example, the Subaru Liberty engine is quite basic in its mechanical specification - it lacks variable valve timing and a variable inlet manifold; its specific power (43 kW per litre) and specific torque (86 Nm per litre) are today only average; and it is not an engine known for excellent NVH. A better benchmark production engine would be the current 156/Spider Alfa Romeo 2-litre four, or the Honda 3-litre Odyssey V-TEC six cylinder. However, it should be stated that not all comparisons of the SyTech engine have been made against the Subaru design - in addition, independent testing has been made of the SyTech's NVH and other engineering characteristics. The use of the Scotch Yoke mechanism allows the con-rod to be made shorter than would otherwise be practical. In a normal piston engine, a ratio of con-rod length to crank radius of 3 - 3.5 is common; ratios lower than this create wear, vibration and noise problems. In the SyTech engine, the equivalent ratio is 2.5 - 2.6, but in practical outcome the ratio is infinitely large, as the rod remains parallel with the walls of the cylinder at all times. The reduced rod length allows a lower deck-height - typically about a 35mm reduction. On a flat four engine, that translates to a decrease in engine width of about 70mm. In the Subaru Liberty installation, the space between the chassis rail and the rocker cover of each cylinder bank is much greater than with the Subaru engine installed - something that can be seen here. In addition, a SyTech engine can be made a little shorter (about half a piston diameter) in length than a conventional boxer engine. The smaller dimensions also translate to a reduced mass - the CMC422 SyTech engine used in the test mule Liberty weighs 30kg less than the Subaru design. The piston motion in a Scotch Yoke engine is sinusoidal, allowing the engine to be balanced with the use of a single balance shaft which needs to rotate only at engine speed. At lower rpm (less than 4500 rpm in the case of the SyTech Subaru replacement engine) the Scotch Yoke design also develops torque more uniformly, while side loadings of the pistons is much decreased over a conventional design - so reducing piston slap. 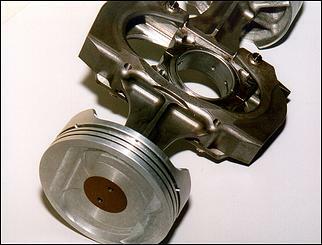 The reduced piston side loadings allow the use of lighter pistons with very short skirts, reducing internal frictional losses. When the reduction in friction from the absence of gudgeon pins, the reduced number of main bearings and the halving of the number of big-end bearings is taken into account, the added friction of the linear bearings on which the bearing block move is effectively negated. In fact, the reduced total internal losses mean that the torque output of the SyTech engine is said to be greater than that of a conventional engine. A reduction in oxides of nitrogen (NOx) and hydrocarbon (HC) emissions is claimed. The former are said to occur because the SyTech engine can cope with the normal measures taken to reduce NOx emissions (ie altered timing and mixtures) better than a conventional engine - power and fuel economy are not significantly worsened. The reduction in HC emissions is a result of the reduced crevice volumes resulting from the top piston ring being located closer to the crown of the piston. The ring can be located such because more heat is conducted along the conrod (and so not through the rings) than in a conventional engine. In addition to these points, other flow-on benefits can be gained from the engine's reduced size - for example, better aerodynamics as a result of a lower bonnet line. 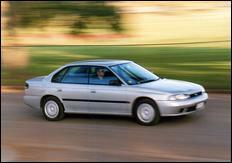 The CMC422 (ie four cylinder, 2.2 litre) Subaru replacement engine was first run in 1995. 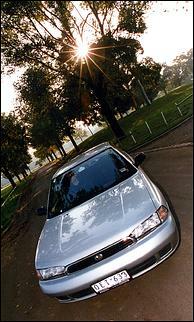 In 1996 second and third CMC422 engines were built, with one installed in a Volkswagen Passat. Eight 422-model engines have now been built, typically developing a peak power of 96kW at 5500 rpm and 184Nm at a low 2500 rpm. 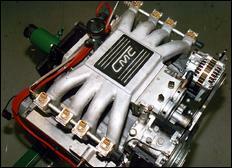 In 1999 the CMC414 (four cylinder, 1.4 litre) engine was build for the hybrid Australian concept car, aXcess Australia II. This engine develops 60kW at 5500 rpm and 120Nm at 3500 rpm and uses a 9.8:1 compression. A new 422 engine is about to be installed in another Volkswagen Passat. The fact that the CMC422 engine has survived being daily driven for 60,000km in the company's Subaru Liberty is a source of amazement to the engineers. Not because they believe that a SyTech engine isn't durable, but because the engine was the first of their 422 engines ever built. 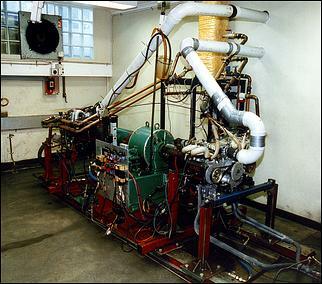 When preliminary engine dyno testing of the engine had been completed, they in fact only belatedly decided to install it in the Subaru - it was never intended that the car would be a long-term test bed. After the first 25,000km the engine was stripped and examined for abnormal wear - none was found. While the initial impression of many observers is that the linear bearing surfaces will be subjected to excessive wear, the patented lubrication system employed by CMC has meant that failure in this area has never occurred. Incidentally, the company hold another patent for the design of the crankshaft yoke connection technique. While the Liberty drove quite well - with good response and more bottom-end torque apparent than normal - it could well be the case that altering the standard engine's valve timing and fitting a MoTeC management system (with ignition timing and air/fuel ratios optimised for engine response) may well have equalled the SyTech design in its performance. So while on the road the car was good, it was hard to draw any definitive conclusions. Certainly, any NVH advantages of the SyTech engine were not apparent - we were told that the proto engine was a bit tired and the noise of the belt-driven balance shaft was very audible... a bit like the whine of a 2.6 Astron, except magnified. CMC has available to it several engine dynos, including one set up to do back-to-back comparisons between different engines. When we visited, the company was working on an updated version of the CMC414 aXcess Australia II's engine; an EJ22 Subaru engine was bolted to the other end of the dyno. However, we also heard talk about making comparisons with the A-class Mercedes engine - a vehicle design that requires a very compact powerplant. Obviously limited in testing and research scope by finite funds, CMC has developed and gone part way to proving an interesting and innovative engine technology. However, to really present a comprehensive case, we'd like to see the company making comparisons of their engine technologies with the best mass produced engines around, preferably by doing comprehensive back-to-back multiple car analyses and including real world emissions test and fuel consumption cycles, on-road performance evaluations, and long distance engine durability trials.